You have an 8x8 square where any 3 squares forming a tromino (including reflections and rotations) must consist of three different colored squares. At least how many colors do you need to paint the entire board? Bonus: How about larger boards? Consider a square not on the edge of the board with its 4 orthogonal neighbours; they all have to have different colors since each pair is part of a tromino. 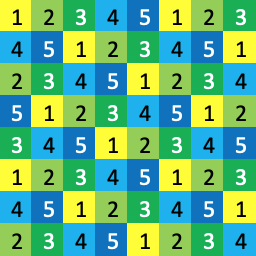 Therefore, we need at least 5 different colors; the pattern shows 5 is sufficient. Not the answer you're looking for? Browse other questions tagged graph-theory polyomino or ask your own question.